This year I spent six weeks visiting wineries and vineyards in Tuscany, which is something I never tire of, as contact with the land and the people who look after it is so essential to understanding what ultimately ends up in the bottle. I tasted an enormous range of wines, mostly from the 2011 and 2010 vintages. The 2011s are generally supple, early drinking wines, while the 2010s are brighter and punchier, with notable structure and mouth-watering acidity. Either way, readers will find a bevy of compelling wines from which to choose. This year marks the release of the entry-level 2011s, including Chianti Classicos, Rossos from Montepulciano and a host of other wines suited to near-term drinking. As readers know by now, 2011 was a drought year with warmer than average temperatures. A warm, dry winter led to a growing season that started as much as a month early. Temperatures remained warmer than normal throughout the year until the very end of the summer, when heat moderated a bit. In some places, growers reported losses of 30-35%, mostly through dehydration. Overall, the 2011s are forward, fruit-driven wines in the style of years like 2007, with perhaps a bit less exuberance. 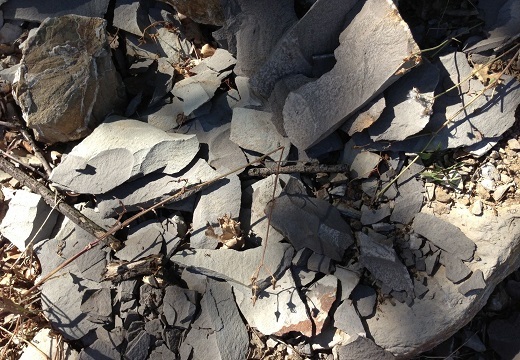 In Chianti Classico, growers dealt with the challenges of 2011 differently. For Luca di Napoli at Castello di Rampolla the trick to the vintage was picking on the early side. Isole e Olena’s Paolo De Marchi blended a little more Syrah than normal into his Chianti Classico. At San Giusto a Rentennano Luca Martini di Cigala added a dollop of whole clusters to his Sangiovese in the Chianti Classico. In other words, there were many ways to deal with the weather. I tasted a few wines that were on the edge of over ripeness, though, so it is a bit of an inconsistent year. 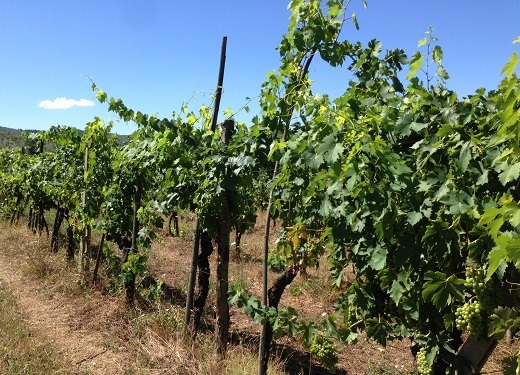 Further south in the coastal areas of Maremma, the vintage appears to be strong. The wines are intense, that is obvious, but that is also the personality of so many Maremma wines. Growers seemed to be more comfortable, and perhaps familiar, with the hot, arid conditions as opposed to those presented by the slow to mature, late-ripening 2010 vintage. I tasted a number of 2011s in Maremma that are exciting, but the style is decidedly full-throttle. In my view, 2010 will go down as one of the great all-time vintages in Tuscany. The wines show beautifully delineated aromatics, punchy fruit and vibrant, mouth-watering acidity, a combination I personally find very appealing, especially at the dinner table. Although 2010 is a vintage for classicists, the entry-level wines are drop-dead gorgeous, so there is no need to delay gratification. Stylistically, the 2010s remind me of the 2004s, but with more fruit and overall depth. The finest wines should age gracefully for years, and in some cases, decades. It was a long, cool growing season that allowed for gradual ripening, which is essential for making wines of balance and harmony. Interestingly, 2010 was also a wet year, with quite a bit of rain, but the data I saw from several weather stations showed rain followed by periods of sunshine and warmer temperatures spread out favorably. Timing, as they say, is everything. There are a few weak wines in 2010, but they are the exception, not the rule. So far, I am enthusiastic about 2012. It was a hot, dry year, but with some rain at the end. The 2012s showed more freshness and vibrancy than the 2011s at the addresses I visited. 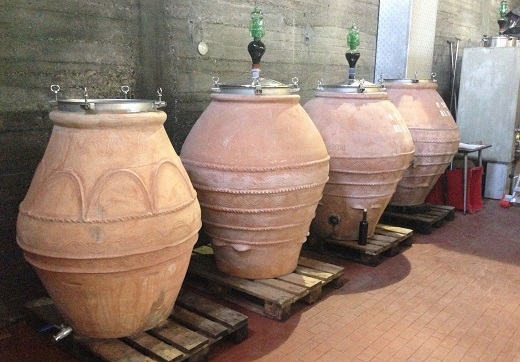 The terra cotta amphora has begun to make an appearance in Tuscany. Or a re-appearance, I should say. Unlike other places in Italy and Europe, where the amphora is an import, Tuscany has a history of terra cotta, although for olive oil. Up until the 1920s, Giovanni Manetti’s family, whose original business is tile, produced terra cotta amphoras. Several other local producers have seen their business boom in recent years. It’s hard to say if the amphora is a fad or is here to stay, but the wines I have tasted so far, including those of Fontodi, Rampolla and Petrolo, are at a minimum intriguing, but absolutely thrilling at their best. In addition to the written commentary and reviews, I hope readers will take the time to explore Multimedia, where we have posted a number of videos with some of Tuscany’s top producers. Recent segments featured Giovanni Manetti of Fontodi discussing his Chianti Classico Vigna del Sorbo and Cinzia Merli of Le Macchiole on the history of her 100% Cabernet Franc, Paleo. My extensive library of past video interviews back to 2011 is also available on Vinous. Over the next few weeks we will be posting interviews with Isole e Olena’s Paolo De Marchi and Castello dei Rampolla’s Luca di Napoli. A few years ago I embarked on a project to build the largest and most extensive library of tastings notes of Italian wines because I feared information, especially about older, rare wines, would be lost forever if those wines weren’t tasted and written about. Early articles featured verticals of Le Macchiole’s Messorio, Poggio Scalette’s Il Carbonaione, Tenuta dell’Ornellaia’s Masseto, Podere Carnasciale’s Il Caberlot and Le Pupille’s Saffredi and Poggio Valente, all of which are in the Vinous database. That work continued last year with Staring into the Heart of Sangiovese, a collection of verticals of some of Tuscany’s most famous wines, including Montevertine’s Le Pergole Torte, Felsina’s Chianti Classico Riserva Rancia, Castellare’s I Sodi di San Niccolò, Castell’in Villa’s Chianti Classico Riserva, Isole e Olena’s Cepparello, Fontodi's Flaccianello, Castello di Ama’s Chianti Classico Bellavista and San Giusto a Rentennano’s Percarlo. The latest addition to our database is an extensive look at Castello di Ama’s Merlot L’Apparita. Going forward, readers can look forward to verticals (in most cases complete) of Antinori’s Solaia, Fontodi’s Chianti Classico Riserva Vigna del Sorbo, Castello dei Rampolla’s d’Alceo, Le Macchiole’s Paleo, Castello del Terriccio’s Lupicaia and Castello del Terriccio and Isole e Olena’s Cabernet Sauvignon, all of which we will be posting over the next few weeks. It is impossible to spend time in Tuscany and not notice the dire financial situation that currently holds the region in a fierce vice grip. With the exception of a few well-financed, family-run estates, there is no winery in Tuscany right now that does not live in deathly fear of their banks. That may sound dramatic, but I am not exaggerating in the least. Credit facilities are being constantly renegotiated as the system struggles to recover from the meltdown of Monte dei Paschi di Siena, the oldest bank in the world, and a big lender to agricultural businesses. Monte dei Paschi was an institution in Siena, like General Motors is in Detroit or Apple is in Silicon Valley. People moved their families to Siena just so they and their children would have priority access to jobs and other opportunities supported by what was once a very generous financial institution. That is all gone now. At the other end of the financing cycle, wineries have a very hard time being paid for their goods, which only adds to the severity of the cash crunch. I sincerely hope Tuscany’s small, family-run estates can find the strength to persevere through what is unquestionably a very hard time. Incidentally, although the specific circumstances are different, I see pretty much the same thing in other parts of Italy as well. Why Are Cellars So Warm? Italy’s financial crisis is happening at a very bad time. 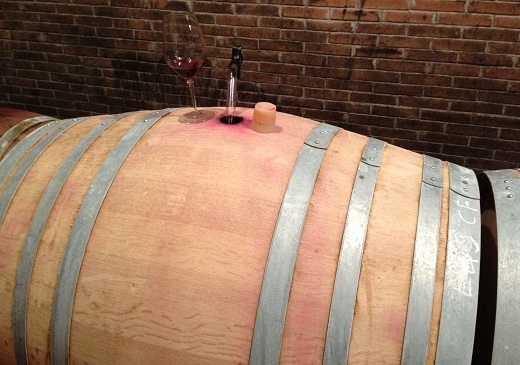 In today’s increasingly global market, wineries need to invest to thrive, not cut back. This year in particular, I noticed a number of wineries, some of them quite famous, still working in passive aging cellars with no temperature control. Given that the summer of 2013 has not been especially warm, I was frankly quite surprised by the temperatures in some of these cellars. There may be a few spots where passive cellars are sufficient, but given today’s weather, the simple truth is that aging cellars must be temperature controlled. Italians have always had a love-hate affair with air conditioning (mostly on the hate side), plus an acute sense of aesthetics that rules over more practical considerations. It is increasingly obvious to me that a number of wines could be – and should be – materially better than they are. One of the big culprits: cellars that are far too warm, a problem shared by many restaurants as well, but that is a subject for another day. As most readers know, Chianti Classico is both a region and a wine. Chianti Classico (the region) continues to face huge challenges. One of the most significant is that the overwhelming majority of the area’s most prestigious wines that technically could be sold as Chianti Classico aren’t sold as Chianti Classico at all. Specifically, Antinori’s Tignanello, Fontodi’s Flaccianello, Isole e Olena’s Cepparello, Castellare’s I Sodi di San Niccolò, San Giusto a Rentennano’s Percarlo and Montevertine’s Le Pergole Torte and others are all wines made in Chianti Classico (the region) but not sold as Chianti Classico (the wine). To better understand how dramatic the situation is, imagine if the top wines in the Langhe weren’t Barolo or Barbaresco, or if Montalcino’s top wines weren’t Brunello. Of course, there are exceptions, Gaja in Piedmont and more recently Soldera in Montalcino, but they are very much exceptions and not the rule, as is the case in Chianti Classico. The current state of affairs is the result of the rules governing the production of Chianti Classico that were in place in the late 1960s. At the time, the use of white grapes in Chianti Classico was mandatory, which meant, among other things, Chianti Classico could not be made with 100% Sangiovese. A handful of trailblazing producers, including Sergio Manetti at Montevertine and Fabrizio Bianchi at Monsanto wanted to make Chianti with 100% Sangiovese, but the bureaucracy was stifling. Manetti created Le Pergole Torte, one of the world’s great wines, then left the Consorzio, never to return. Some estates were able to handle the politics a bit better, including Felsina, Castello di Ama and Monsanto. The success of the early 100% Sangioveses inspired a second wave of wines in the early 1980s made by producers who remained within the Consorzio for most of their production, but sold their 100% Sangioveses as Vino da Tavola, ironically the lowest designation at the time. Those producers include Giovanni Manetti at Fontodi, Paolo De Marchi at Isole e Olena and the Martini di Cigala family at San Giusto. Their top wines all met with resounding success. Along the way, the Chianti Classico disciplinare was finally changed to allow producers to make Chianti Classico with 100% Sangiovese if they so desired, but by then it was too late, as the wines mentioned above had all achieved a level of prestige and price far beyond ever the upper range of Chianti Classico. That brings us to the present day. A significant number of the most prestigious wines made within the Chianti Classico appellation still aren’t labeled Chianti Classico. If that sounds confusing, welcome to Italy. In an attempt to address the issue, the Consorzio del Chianti Classico has created a new designation, which will be called Chianti Classico Gran Selezione. 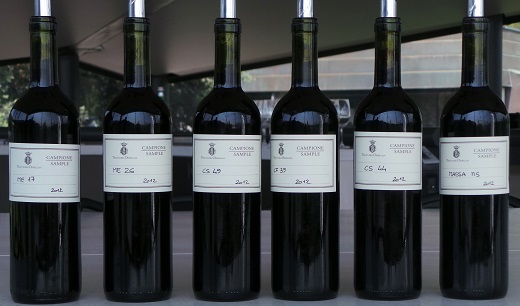 The Gran Selezione is intended to sit above Chianti Classico Riserva at the hierarchy of each winery’s production. There is only one problem. None of the region’s leading producers is likely to label their top wine Gran Selezione. The wines that might become Gran Selezione are basically top Riservas, like Antinori’s Badia a Passignano or Fontodi’s Vigna del Sorbo. That means estates might have as many as four separate levels of wine: Chianti Classico, Chianti Classico Riserva, Chianti Classico Gran Selezione and IGT. Frankly, it makes my head spin. Given how hard it is to sell wine and put forth a message in today’s world, in my opinion, changes to well-established appellations should be carried out only if absolutely necessary and as a measure of last resort. Ask ten producers about the Gran Selezione and its regulations, and you will get ten different interpretations. That should serve as a guide for how much of a marketing nightmare pushing this change through is going to be. The end consumer needs simple messages. This is especially true for historic European appellations that are already virtually impossible for the consumer to navigate. A phrase like ‘Gran Selezione’ is two words and is hard to pronounce. No thanks, I’ll just take a bottle of Malbec from Argentina or Cabernet Sauvignon from Napa Valley. That is exactly what the average consumer’s reaction will be. In order for a wine to be sold as Gran Selezione it needs to meet a set of analytical parameters and be submitted to a tasting panel for approval. The biggest and most divisive criteria is that a Gran Selezione must be made from estate owned or controlled vineyards because one of the objectives is to highlight the great terroirs of Chianti Classico. In other words, a wine made from purchased fruit can’t be a Gran Selezione. This creates an issue for some of the region’s larger producers (those who purchase fruit) because their top labels will automatically be disqualified from the Gran Selezione designation. Since the larger producers hold more power within the Consorzio than the smaller producers, well, you can guess what direction things are likely to go…. So, what is the answer? I would like to see more focus on the individual villages within Chianti Classico, which is a vast appellation. I dream of a day when Gaiole, San Casciano, Radda, Barberino, Castellina, Panzano, Greve and the other villages within Chianti Classico are spoken about with same reverence as Vosne-Romanée, Chambolle-Musigny and Gevrey-Chambertin, or closer to home, La Morra, Castiglione Falletto, Serralunga, Barolo and Monforte. The best wines in Chianti Classico are very much terroir wines, and at the top, can compete with the finest from around the world. There is no doubt about that. It is time to accept that the region’s producers are not going to label their world-renowned wines as Chianti Classico or some derivative. That train left the station a long time ago. One solution might be to modify the IGT designations so that they are more specific. For example, the all-encompassing IGT Toscana could become a set of more detailed appellations, including IGT del Chianti Classico, which would allow some linkage for wines like Percarlo, Tignanello and Cepparello to the place where they are actually from. Perhaps in the future we might see IGT di Gaiole, IGT di Panzano, IGT di San Casciano Val di Pesa, etc. that might provide even greater clarity and definition to the village level. The best way for Chianti Classico to compete in today’s market is to elevate the awareness and uniqueness of the villages that dot these pristine hillside vineyards between Florence and Siena. The great wines of Maremma and Chianti Classico (not to mention Montalcino) are without question worthy of the praise they so often receive, but the truth is there is much more to Tuscany than just the famous appellations. I tasted a number of delicious Chiantis made outside the Classico zone, the best of which offer superb drinking at everyday prices. Then there is the area around Grosseto, where Sangiovese takes on richer tones in Morellino di Scansano. Montepulciano is home to some of Tuscany’s most breathtaking hillsides, as well as delicious Rossos and Vino Nobiles. The Val d’Orcia, just a few kilometers south of Montalcino, is an exciting, emerging area. Carmignano is another region where prices for the best wines remain quite reasonable in today’s market. In short, Tuscany holds within it a lifetime of discovery. I hope readers take the plunge.